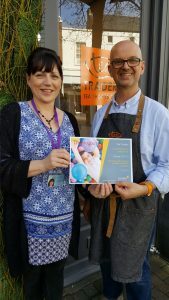 A new Carmarthenshire business has raised funds for Cerebra through a series of storytelling sessions. Tea Traders opened in November in Guildhall Square Carmarthen and started hosting a Cerebra collection box shortly after. 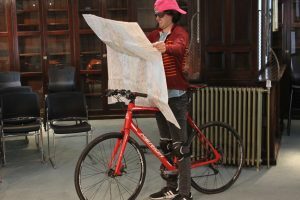 Owners Paul Raven and Nick Lee then decided that they wanted to throw an event to support the charity and came up with the idea of holding a series of storytelling sessions with local storyteller Liz Evans. Liz led a fun interactive session for children that focussed on local myths and legends. She also took part in an adult’s evening which was based around Celtic legends and local stories. Both events were a huge success and have helped Tea Traders raise a total of £125.12 for Cerebra so far. If you are a business, you an find more information about how you can help us by hosting a collection box here. Samuel cheers buddy to marathon glory! 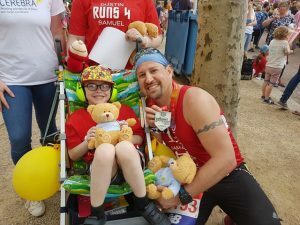 On Sunday 22nd April, American Dustin Erhardt ran the London Marathon for his buddy Samuel and to raise money us. 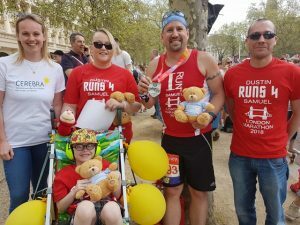 Dustin met 7 year-old Samuel through the organisation I Run 4 which pairs runners and special needs children and adults so that the runners are motivated by their special buddies, and the special friends can finally find a way to run even if they can’t literally do so themselves. Dustin, who lives in North Dakota in the USA explains: “I had the honour of being matched with an amazing little boy named Samuel, who has autism. He has become like a nephew to me and while I was training we exchanged pictures, videos, medals, encouragement and so much more. In training, with every mile that got tough, I knew he was right there with me encouraging me to keep going. 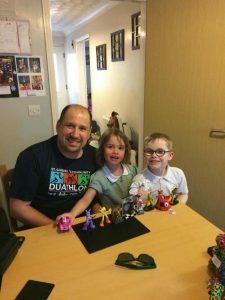 Cerebra have supported Samuel’s family and his little sister Phoebe so it was great that Dustin could run and raise money for us. 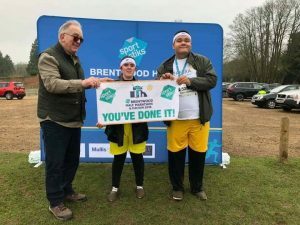 Samuel and Phoebe, along with mum Gemma and our Events Coordinator Cecilia Bufton waited at the finish line on the day, eager to cheer Dustin on as he approached the end of the gruelling 26.2 mile course. Gemma said: “Samuel was so excited to be at the finish line to welcome Dustin home. We’d tied Cerebra balloons to the railing so that he would be able to spot us and when he came round the corner Samuel’s face was a picture! Samuel coped really well with the noise and the bustle – the disabled waiting area was a lot quieter and his ear defenders helped. He really liked watching all the mascots – particularly someone dressed as Big Ben! 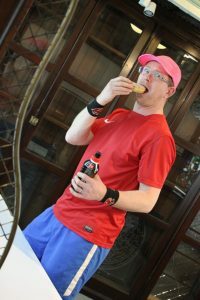 Dustin enjoyed the whole experience: “I’m so grateful to Cerebra for giving me the opportunity to run in the London Marathon. On the day it was quite hard – very warm with the sun beating down – and I decided to slow my pace to make sure that I made it to the finish line. In the end I finished in 5hrs 44 mins. It was an amazing experience – the sights of London, the sheer number of people, and the spectators were incredible, handing out orange slices and chewy sweets for sugar. So many people were running for charity, it was emotional and motivational. 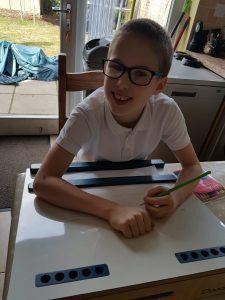 Dustin has so far raised an incredible £2248 for Cerebra, surpassing his initial target of £2000. You can still donate through Dustin’s Virgin Money Giving page. 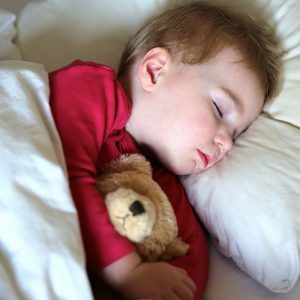 Dr Caroline Richards and Professor Chris Oliver from the Cerebra Centre for Neurodevelopmental Disorders talk about the Sleep Project which aims to understand and reduce sleep disorders in children with developmental delay. Despite this great need, research on sleep in children with neurodevelopmental disorders is sadly lacking. We know the least about sleep in the children for whom sleep is arguably most important. The Sleep Project, conducted by the Cerebra Centre for Neurodevelopmental Disorders will change this. We lead cutting edge research to understand the different types and causes of sleep problems in children with neurodevelopmental disorders, identifying how poor sleep impacts on children and their families and trialling new interventions to reduce sleep problems more effectively. Projects: We have completed five core components to date. Public Knowledge: A key aim of the sleep project is to ensure that as we improve scientific understanding of sleep in children with neurodevelopmental disorders, we simultaneously share that information with families, clinicians and educators. Research traditionally takes 10 to 17 years to influence real world practice – that is an unacceptably long time. We are committed to reducing this lag. In addition to publishing our research in high-impact academic journals and speaking at scientific conferences, we provide regular talks on sleep to inform and update parents and professionals. These have included talks at schools, parent support conferences, national professional networking events and large public conferences such as The Autism Show. In addition to this, we co-produced a Sleep Guide for parents, in partnership with Cerebra which is freely available via Cerebra’s website. The guide explains how problems with sleep may develop, the specific nature of sleep problems in children with rare genetic syndromes, how to assess sleep problems, and how to intervene to improve sleep. Alongside the guide, we also co-produced brief Sleep Cards to be used by Cerebra’s Sleep Service. These provide bite-size chunks of information on sleep interventions that the Cerebra Sleep Practitioners can give to families they are working with, to help parents and carers to implement evidence-based sleep interventions. Investing in People: The Sleep Project will increase expertise in Sleep Research in the UK. Through the first four years of the project, we have trained two PhD, seven Clinical Doctoral, three Masters and 10 Undergraduate students. The majority of these students are now working in either research or clinical psychology and therefore this investment in training has increased UK expertise in sleep problems in neurodevelopmental disorders. You can find out more about the Sleep Project here. You can also find out more about the work that the Cerebra Centre for Neurodevelopmental Disorders does here. 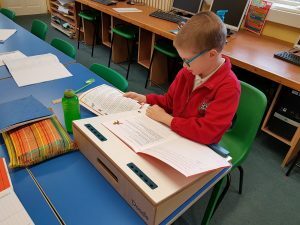 One of our families has written a blog post about the many adaptations families with children who have disabilities have to make. 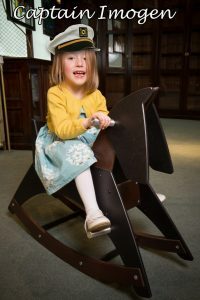 “Several years ago we were referred for an assessment by an OT to look at possible adaptations we might need to our house to make things more suitable for the girls needs then and in the future. We were in fairly uncertain times with no clear idea of which way things would go health wise, so it felt like we had to consider advice from any professional willing to offer it. Following her assessment there were some fairly obvious things that were going to make a tangible difference once completed, like an easily accessible shower with a seat to rest weary legs. Level access to the property for wheelchair access and to prevent trips and falls when crossing the threshold. There were also some that came as a shock! Had we thought about how to get upstairs as things got worse? Would our stairs be suitable for a stairlift or if needed could we accommodate a through floor lift? These weren’t the conversations we ever thought we would be having. As it happened she was a tad over zealous and the larger adaptations, thankfully, have never come to fruition……and breathe. But it certainly adapted our thought processes and our minds went on a journey of worry and stress that we hadn’t necessarily prepared for and actually weren’t needed. But as I sit back and consider the past 11 years the adaptations we have had to make are many, but to the outsider many maybe frustratingly hidden leaving folk wondering what all the fuss is about! Some of the things that have made a real difference to quality of life have been fairly unsophisticated like rubber bands round utensils and tubigrips on their arms to improve the messages sent back to the brain so eating and writing is more controlled. Getting seating and sleeping spaces right have prevented pain and spasms and enabled rest and ability to stay still! This might have been with bespoke specialist seating that come at an eyewsteringly high price or, with trial and error, the correct cushion or pillow shoved into various corners to prevent bumps or prop up legs! We no longer have an old icecream tub to hold our household medications…we have a whole double cupboard dedicated to the bottles, tubes of creams, spacers, inhalers, dosset boxes and all other necessary medical paraphinalia that keep them well & sparkly! We have walls decorated with visual resources painting a picture of how the days are (in theory) going to pan out. Not too detailed so minor changes can’t be coped with, but detailed enough to be the lynchpin for the day. Essential to help with the difficulties with transition and inherant need to control…ahhh! Visual prompts to accommodate one child with short term memory difficulties & the other struggling with executive functioning & concentration. The lounge which in theory is our calm space is filled with peanut balls, exercise mats, and a human sized bowl for spinning and chilling in that provides just enough sensory feedback to keep our sensory bunny calm! Though doesn’t necessarily calm everyone else as they create an undesirable trip hazard in the thoroughfare! Adaptations to meal times to accommodate the sensory culinary preferences (cottage cheese, chickpeas and anything burnt!) And a constant supply of crunchy snacks, chewing gum or chewy items to prevent any more bite marks in furniture or chewing of clothes due to the constant oral sensory seeking behaviour. Normal planning doesn’t do for us! Logistical management takes on a new level considering fatigue, sensory overload, medications, splints, ear defender’s, weighted jackets, visuals and also how to practically manage 2 children in wheelchairs when their maybe only one adult! Adapted bed time routines, that involve so much more than bath, teeth, pj’s story & bed. Adapted life plan! Not just avoiding pomotions & working part time hours, but a whole different career, a whole different mindset. How do you get the flexible working that takes into account the days off school due to frequent sickness or school refusal, the micro management of meetings or appointments, tests & all the necessary paperwork, DLA, EHCP, carers assessments? Oh yes & the financial restrictions put on you when you receive carers allowance! You can have it if you care for someone more than 37 hours, but you can’t claim it twice for looking after 2 people & by the way you can only earn £100 a week! If you have a career that you trained hard for actually getting a contract for so few hours is nigh on impossible! The solution I have fallen into is effectively being my own boss, working hard when I can so it doesn’t all fall apart when I can’t! Trouble is that level of juggle sometimes leads to me falling apart! Emotional adaptations you have to make along the way can have massive impacts. Relationships are tested as you effectively tag team the caring role, no time to talk or process the latest appointment, diagnosis or meeting about school. The different timings in the processing of it all as one crashed & grieves the other has to up the ante! Friendships are tested and sometimes don’t survive, so a new support network formed. Extended family roles adapted as the expected role of grandparents is morphed into respite carers, and comes with it a whole set of logistical & emotional challenges. But then there’s the positive adaptations that have taken place. The appreciation of the smaller details, celebration of the moments when unexpected milestones are achieved that otherwise may have been taken for granted! A different level of understanding your child inside & out! 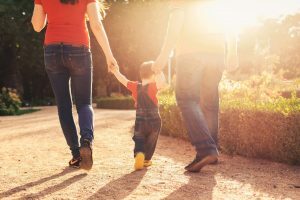 The involvement of family to achieve a special trip means they get to be part those intimate moments that they may not otherwise have been part of…Disneyland, trips to London. The adaptation of our attitude on life! Live for today not for tomorrow, learning to dance in the rain & not waiting for the storm to pass, remembering it’s not what happens that’s important but what you do about it! But really learning that you can’t change the situation you haven’t chosen to be in, but you can change the way you think about it and embrace the necessary adaptations rather than fight against them!”. You can read this, and other blog posts, here.